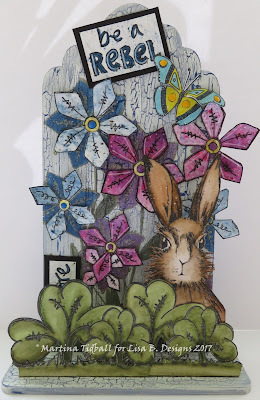 Welcome to Lisa.B.Designs : MDF Uprights, PaperArtsy and a Rebellious Hare! The first stage was to paint the whole MDF Scalloped Tag piece (assembled) with one layer of Sax Blue Starlights. I then coated the front of the piece with a thick layer of Imagination Crafts Crackle Medium and set aside (you can heat dry, but I honestly think it looks better when you leave paints and crackles to their own devices!). Taking a thick brush primed with Media White Gesso, I swiftly covered the whole of the front of the tag, using vertical brushstrokes and not going over, or back over any areas. This is important, as the crackle reacts with the paint so quickly that going over it again makes it peel and move, giving you lumps. At this point, I had a tag with the front crackled in white and a hint of the Sax Blue Starlight showing through... Now for the stamping! Huzzah! 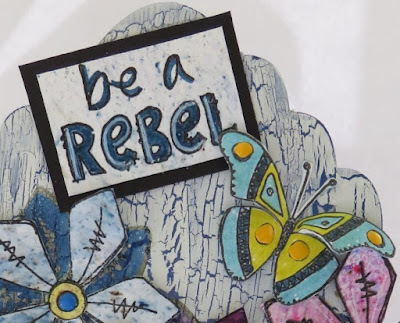 Using PaperArtsy JOFY 50 (catchy name!) 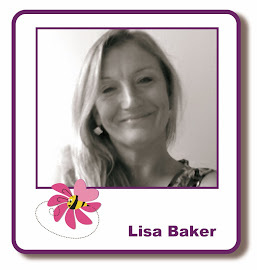 I stamped the flowers, leaves and grasses several times on my tag front, ignoring any overlapping. I stamped in Forest Moss Distress Ink and then heat embossed with Wow Clear Detail Powder to seal it. At this point I should be honest: I think it would have looked better if I had used black ink, but I thought I would keep going anyway... a lesson for next time! Now to sort out the messy flowers and overlapping! Taking some Watercolour Card, I sprinkled some Blackcurrant Infusions over the top and then spritzed with water. I varied the intensity of the water and then let the card dry. Using Black Onyx Versafine I stamped the flowers again and then cut the blooms away to be used on the tag. I repeated this process to make some blue flowers, this time using some 'In the Navy' Infusions and also some flower middles using 'Lemoncello'. Once all my blooms and centres were cut, I started to arrange them on my piece. I did not want them to fit over the tops exactly, so I had a play. My thought was that the petals that were stamped directly onto the MDF would be in the background, so I would colour these straight onto the crackled paint; they would be 'flat' compared to my cut-out dimensional ones (if that makes sense). Now to make the piece a little more dimensional! I love the quirky 'bushes' that are on the JOFY 50 set, so I thought I would see if they could stand up at the front. I stamped them onto some thick card and then cut out leaving a wide 'tab' at the bottom. I coloured in with Distress Inks (Forest Moss and Bundled Sage) and then folded the tab in half. I glued the bottom section, tab down, onto the MDF a little away from the main upright. I liked it, but it needed a character to pop out...cue a Hobby Art March Hare! I stamped, coloured and cut the hare from some card and did the same with the butterfly and the words from the JOFY 50 set (I stamped the words onto some leftover Infusions card from earlier). There we have it: Harold (?!) the Hare is being a rebel, and why the devil not in this day and age?! I think stamping in the black at the beginning would have still looked better, but hey ho, nobody knows that, do they?